Catch up with our past week of streaming from the Paizo studio! 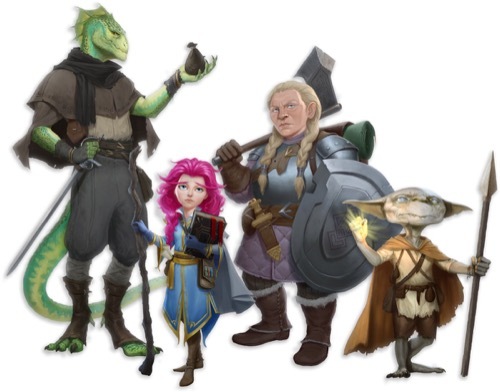 To follow along with us LIVE, subscribe on Twitch @officialpaizo where we share Pathfinder and Starfinder behind-the-scenes and lore and host weekly campaigns from our own office and our partners. The PCs in our Pathfinder Second Edition live-play discover that the barge isn't as safe as they thought it was. Plus, a strange encounter on a beach left the party with even more questions! Character illustrations are by @pxelslayer and music featured is "Witchwood Harp" from the Witchwood SoundSet, used with permission from Syrinscape. Missed the first episode? Watch The Boat Party on YouTube. Join us for Episode 3 this Thursday, April 25, at 12:00 PM Pacific time on Twitch! Nidal is one of the oldest nations in Avistan. It also happens to be controlled by followers of the lawful evil, Zon-Kuthon! We took a scary stroll through this city of sinister citizens on this Pathfinder Friday, Episode #41 with Amanda Hamon, @amandahamon. Music featured is from Pathfinder Legends, produced by Big Finish. Looking for more Pathfinder content? We host Pathfinder Fridays on our stream every Friday at 4:00 PM Pacific time. Last week we welcomed John Compton, @archaeotagh and Tonya Woldridge @paizoorgplay to cover the upcoming conclusion of the current season of Starfinder Society and the beginning of the next one, Year of a Thousand Bites! Watch the video, plus check our announcement from the Paizo blog for more. Looking for more Starfinder content? We host Starfinder Wednesdays on our stream every Wednesday at 4:00 PM Pacific time. What's new on our YouTube channel this week? Our live-play of Pathfinder Second Edition kicked off with episode 1! Learn about demons and elves on Golarion! Find out what didn't make it into the Starfinder Beginner Box! Plus a sit down with Crystal Frasier, author of Soldiers of Brass.